I guess I kind of threw you with that title? To be honest it threw me too; who would ever have guessed that Hannibal, BA Baraccus, Face and Raving Mad Murdoch had the secret to SEO link building in 2013 up their sleeves all those years ago. I was having a conversation with another SEO (Tim Grice) the other day about how SEO has evolved and become more difficult for small businesses due to the increasing onus on linkable assets (great content, tools, brand equity, relationships etc). I am not talking about technical SEO here – technically things have not changed incredibly of late, there have been additional considerations such as open graph protocol, structured data and page speed becoming much more significant but essentially things have been moving on a consistent trajectory. On the other hand link building and off site SEO has undergone a sea change, and one for the better good of the internet (IMHO). It’s not really a change of direction for any of the search engines; they have always been trying to achieve what they are now finally achieving – i.e. a situation where the sites that genuinely are the most relevant and appropriate are being surfaced for users searches rather than sites that have been gamed for positions using things like exact match domains and mass linking from low quality sites with exact match anchor text. For many SEO’s the game has always been about trying to beat the search engines, find loopholes and ways to trick the search engines into thinking that you have the most appropriate content. This does not go for everybody in SEO – there are many link builders such as Eric Ward who have always taken an approach of building connections that could have occurred naturally and that make sense and just encouraging those relationships to actually happen. But now that the easy life is over SEO’s need to be a lot more creative and experimental in their thinking and planning – again a big positive for the industry. Not that we were ever short on creative minds in SEO, but now that things have evolved at least those that have taken the longer and steeper road will not have to glance sideways at competitors who have a backlink profile straight out of the landfill site and have second thoughts about the approach we are taking. It’s tough when you have clients/bosses asking for the logic on your slower, more costly content-based strategy when it is plain obvious you are being beaten by a much easier strategy. Thank god those days are coming to an end. Anyway; back to the A-Team. If you are a young whippersnapper and are unfamiliar with arguably the best 80’s show to ever grace the TV screen then get into your Dad’s old cabinet and look for these chunky brick sized items that have tape in them – those are called videos – find one with the A-team written in faint biro on it, grab a penguin bar (small chocolate biscuit) and settle on the sofa for a televisual extravaganza like never before. Oh and it may be worth switching your imagination on, the special effects in those days were not what they are nowadays. Assuming that we are all up to speed on who the A-team are I want to talk about the last 15 minutes of every single show. This is the bit when things are looking really dismal, the chips are down and the bad guys have pretty much taken over. Hannibal and his team then lock themselves in a garage and quickly audit the available weaponry – usually just old bits of wood and metal and there is always a welder. They then assemble the available resources into a mega weapon vehicle – It bursts through the splintering side of a barn wall and picks out the army of bad guys one by one to claim a victory against all the odds. That is what SEO link building is now all about (if you are a small business). What does this have to do with SEO link building in 2013? Analysis of business, it’s place in the market, strategic goals and KPI’s along with a clear understanding of budgets and CPA targets. This is the A-team strategy. Websites can sometimes be a like a box full of lego, or indeed a warehouse full of corrugated iron and pieces of wood and a welder. SEO’s need to fully audit the linkable assets of a company; blog, industry reports and research papers, tools, whitepapers, infographics, images, well known staff, people they sponsor, corporate relationships/partnerships, charitable work, video content, buckets full of sharp tacks and sticky oil etc etc. This can be done in many ways but I find that with new clients it helps us to understand the industry well if we look at the backlinks of a number of the key companies and also informational hubs in the space and map out commonalities as well as links that make sense which have been gained through unique and creative strategies. Identify the key influencers in the space – best tool I have used for this is Little Bird (still in beta and pretty pricey), Followerwonk is also good and not too pricey (especially if you are an SEOMoz Pro subscriber) and even Twitter can be pretty good when you run searches for specific keywords. Identify the sites the influencers are talking about and linking to. Find out where your customers hang out on the web – just ask them to list their top 5 websites within the industry. 5. Match the inventory of linkable assets to the target sites – i.e. What is the most appropriate asset you have which can be used to approach target site A to ask for a link? This needs to be done objectively as if you do not have anything that could benefit a target site then you are going to need to create something new. 6. When planning and creating new content it is good if you have a group of target websites in mind for it so that you get the most bang for your buck. Guest posting is often a good investment but it only typically gets you one link so you need to choose the site carefully so that you get a good level of traffic from your time investment. 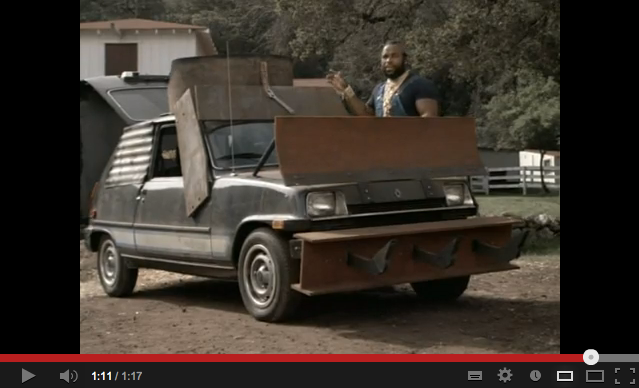 So that’s it – The A-team approach to SEO link building. Great post Joel – and anything that shoehorns the A-Team & MacGyver in is alright by me! Yes – a tenuous but apt link I think. On the surface it does seem tougher. Actually scrap that, it is tougher. BUT a lot more fun and fulfilling.